Enhance your upper body performance with the Skins DNAmic Short Sleeve Top. By supporting and stabilising the core, shoulders and biceps and wicking moisture to keep you dry, this compression top will be your go-to for under your kit on game day. "Loving it - good fit and comfortable"
"Quality product with support that is excellent." Enhance your upper body performance with the Skins DNAmic Short Sleeve Top. 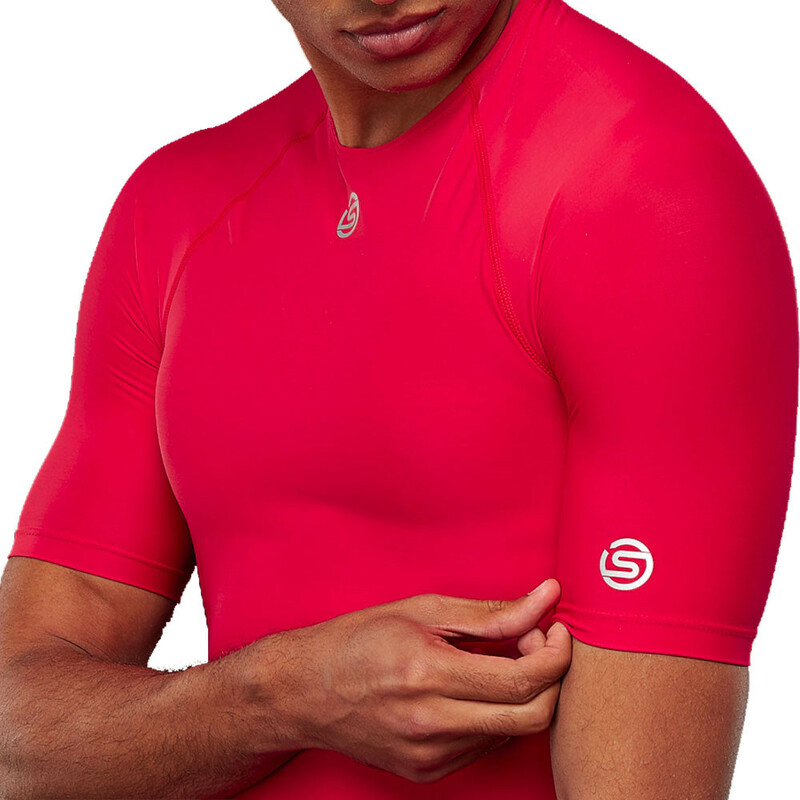 By supporting and stabilising the core, shoulders and biceps and wicking moisture to keep you dry, this compression top will be your go-to for under your kit on game day. Push your upper body harder for longer without the next-day muscle ache in the Skins DNAmic Short Sleeve Top. The Skins Short Sleeve Top offers excellent Dynamic Gradient Compression. This technology is Skins most advanced compression technology and increases muscle oxygenation, stabilises active muscles and reduces blood lactate build up. In turn, this construction enhances performance and speeds up recovery time. In addition, a functional design of the skin fit is a unique sizing system that is based on Skins unique body mass index (BMI)/anthropometrical algorithm, because you only get the full benefits of gradient compression if your Skins fits you properly. Additionally, The tee offer superb muscle focus in biomechanically positioned panels and seams that support and stabilise the muscles to reduce fatigue and risks of injury. A moisture-wicking fabric is a top priority when constructing the tee as it works endlessly to wick sweat and excess moisture as it's produced. Once wicked the fabric transfers the moisture to the outer layers where it can be easily evaporated, ensuring you stay cool, dry and comfortable. The tee features a warp knit construction which is made from a different mix of yarns that give you a carefully calculated level of stretch for controlled compression and durability. Lastly, The compression tee offers you 50+ UV protection that protects your skin from the sun's harmful rays during your chosen activity. 50+ UV Protection - Protects your skin from the sun's harmful rays.